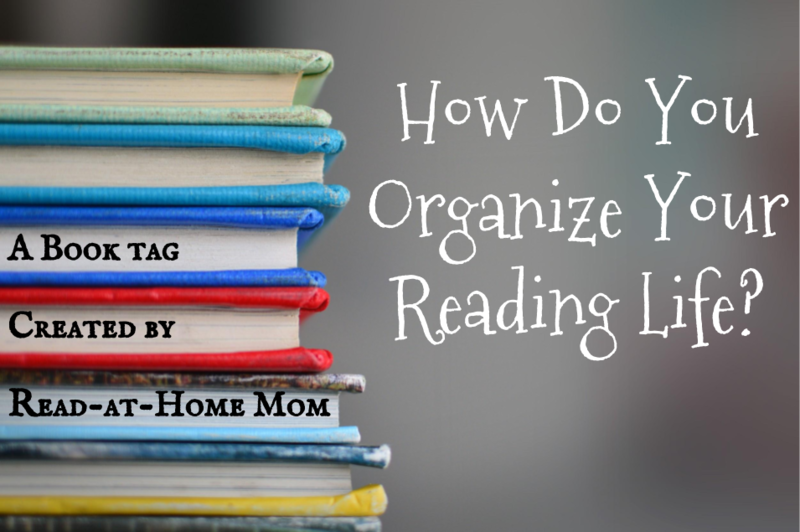 Read-at-Home Mom: Book Tag: How Do You Organize Your Reading Life? How many books do you typically read at one time? How many are you reading right now? I am usually reading at least three books at once. One or two never seems like enough, especially if one is an audiobook. I don't always adhere to this, but I typically like to be reading one audiobook, one adult book, and one children's book at the same time. Sometimes, if I'm reading a new children's book, I'll also read an old one simultaneously. Right now, I'm between audiobooks but I'm reading three physical books: Lakeside Cottage by Susan Wiggs, Sixpence in her Shoe by Phyllis McGinley, and Each Little Bird That Sings by Deborah Wiles. How do you keep your place in a book? When I read physical books, I typically don't do anything in the book itself to mark where I've left off. I either make sure to read to the end of a chapter so I can just remember the chapter number, or I update my status on Goodreads with the page number. Do you take notes as you read? What is your preferred note-taking method? I almost never take notes while I'm reading. I do sometimes take pictures of passages I like, so I can either share them on Instagram or remember to refer to them when I write reviews. Otherwise, I finish the book first and then try to jot down a few ideas for my review before finishing my next book. I keep track of my reading on Goodreads and in a bullet journal. Goodreads is the method I prefer, but I'm doing so many reading challenges, I wanted to keep track on paper too so I could have checklists for each challenge. Do you set reading goals for yourself? What is your current goal? I usually set a goal for the year on Goodreads. Since I like to keep track of everything I read, including picture books and board books I read with my kids, I usually inflate the goal so that it's still a challenge to complete even with all those short books included. This year, my goal is 500. Do you participate in readathons? Which ones are your favorites? I like readathons and I wish there were more. I really miss Mother Reader's 48-Hour Reading Challenge, and it's been hard to find another that I like as much. I have been doing Bout of Books regularly for about three years, and it's fun because it happens three times a year and it's really laidback. This year, I've also discovered the Seasons of Reading readathons. I didn't do very well with Spring into Horror, but I'm hoping to do better with High Summer. When you decide what to read next, do you select from a reading list or choose books at random? I don't do well at all when I try to stick to a specific list. Open-ended challenges work well for me, but when it comes time to open up a book and start reading, I need the freedom to choose what I feel like reading at that moment. I do have a tentative idea of which books I'd like to read in the next few months, but I never know which book will be next until I pick it up and start to read. Do you ever read series books out of order? I used to be much more relaxed about reading out of order, and I think I'd actually like to start giving myself permission to be that relaxed again. I would never suggest reading something like Harry Potter out of order, but with things like romances and cozy mysteries that are a little bit lighter it just doesn't seem to matter as much. You can always catch up on what you missed in the first couple of chapters. How do you store the books you own? Do you have a system for organizing them? My husband and I are both librarians, so we own a lot of books, and because we live in a small townhouse, we don't have much of a system yet. Our bookshelves tend to be arranged by size so we can fit as many books as possible into our limited amount of space. Other books (mostly for our kids) are in boxes in the garage, organized into categories such as Christmas, easy readers, Spring, books for babies, books for one-year-olds, etc. When you finish reading a book you've bought, do you keep it or pass it on? We buy the majority of our books used. When I finish an adult book I've bought used, I almost always donate it to the Friends of the Library or give it away to someone else. When we buy kids' books, we typically read them to help decide when our kids will read them and then pack them away until our kids are old enough for them. Do you review everything you read? How do you decide which books to review? I used to review almost everything I read, but with three kids, there just aren't enough hours in the day anymore. Now I pretty much only review books about which I have something definite to say, or which I have requested for review from NetGalley or Edelweiss. I also used to review everything on my blog. Now I try to post one children's book review per week on the blog and review most other things on Goodreads. How do you find out about new books you might want to read? I have a whole post in my archives about how I discover new books. The short version is that I get recommendations from my husband, Instagram, my friends' to-read lists on Goodreads, fellow bloggers, and my library's Novelist database. I had fun doing this, thank you!! Very interesting tag. I find my reading habits have shifted dramatically in the past few years for reasons ranging from a change in jobs to getting involved in the online book world. But I'm still reading! Ummm yeah, I kind of LOVE this post. And, bonus, it gives me a blog prompt! I'm doing the Herd's blog ahead challenge, and now I have something for July sixth. So thank you so much for that. You rock.